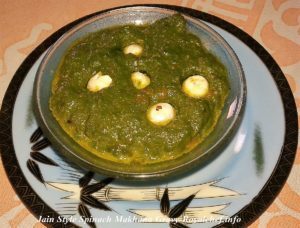 This is a recipe for making at home typical Jain Style Spinach Makhana Subji or Palak Makhana Gravy/ Curry without making the use of onion, ginger or garlic. This Palak Makhana Gravy is prepared using Spinach Puree and Tomato Puree along with milk, cream and some selected spices. Preparation: Wash the Spinach Leaves, boil them, keep them aside for cooling. While grinding Spinach add the Turmeric Powder, Green Chilies and prepare the Puree. Boil the Tomatoes and prepare the Tomato Puree. Roast the Makhana and keep them aside. Heat the Ghee in a Kadai and add the Cumin Seeds, Tomato Puree and saute for about a minute. 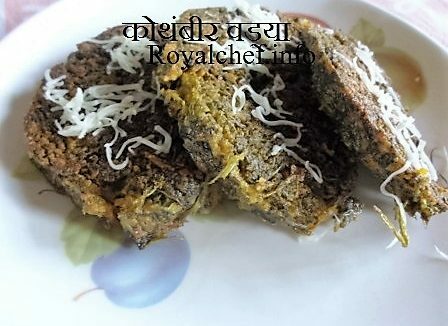 Then, add the Spinach Puree, Salt, Red Chili Powder, Garam Masala, Cinnamon Powder, Milk and cook for 2-3 minutes on a slow flame. Then, add the Fresh Cream and Makhana and cook for 2-3 minutes on a slow flame. Serve the Spinach Makhana Curry with Paratha or Jeeera Rice.